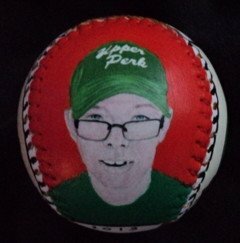 This Legends Hand Painted Baseball features my original paintings of my Granson, Paul Whitcomb. Side one is my close up painting of Paul Whitcomb. Click here for a closer look. 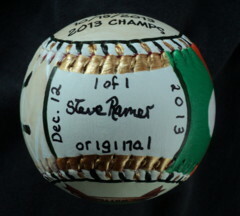 Side two has my painting of Paul laying down a game winning bunt. Click here for a closer look. 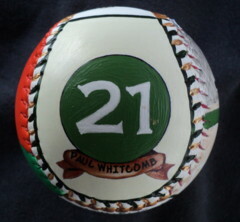 Side three has Paul's number 21 and name in team colors. 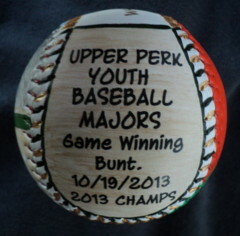 Side four tells the story of the bunt. 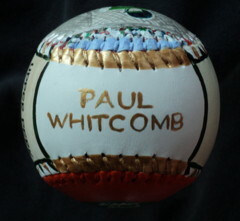 Side five, which is the top of the baseball, has "Paul Whitcomb" hand painted in gold. 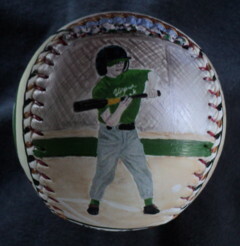 Contact Me To Order a hand painted baseball or softball of your son or daughter.